Hello, I have been teaching English for a lot of years but I know I still have a lot to learn, and this site seems to me a wonderful idea. Thanks to all the teachers for sharing their work. Multiple choice: A, an, some, any, much, many. 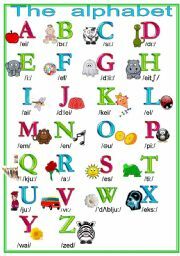 My poster about the alphabet, with the pronunciation of the letters. Pictures from http://www.clker.com/ and from http://www.clipart.co.uk/index.shtml (good sites, by the way) You have the words on the second page just in case. The poster can be edited if you want to change some pictures. Maybe you find it useful. 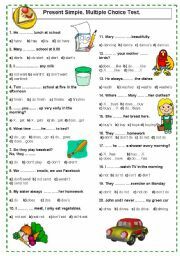 It is a poster featuring uses and form of the verb to be. I laminated it and put it on the wall. Pictures taken from http://www.toutimages.com/cliparts.htm Hope it is useful for someone else. 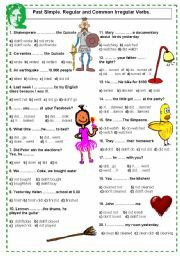 A poster about the verb To Have Got, to laminate and put on the wall. It may be useful to you too. It is a diagram-mindmap about present simple. The second ws is like the first one but with some gaps to fill. Hope you like it. Practise the parts of the body with Woody, from Toy Story. Interactive. With a lot of colour because I liked some of the ones I saw here which are very colourful. Practise parts of the face with Heidi. Interactive. I�ve learnt how to do it because of this site. Hope it will be useful. A memory game about irregular verbs. Inspired by other memory games from this site. This is a ppt about the countries that form Great Britain and the United Kingdom. The countries appear one by one when you click and then you have four interactive questions to check their understanding. It�s completely editable in case you want to add some information. There is-There are. A, an, some, any. How to use there is and there are with a, an, some, any. 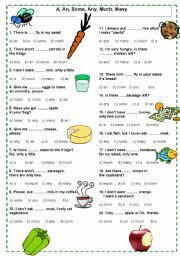 An activity to practise the use of However and Therefore to link sentences. A brief explanation about SINCE and FOR, and twenty sentences to fill the gaps. 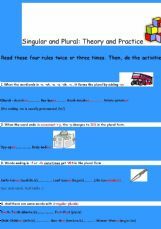 Simple theory and practice about forming the plural. 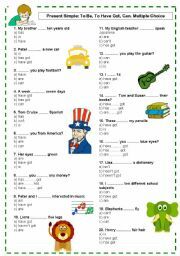 The students have to fill the gaps, with the past simple of some given verbs, in a text about Raymond Chandler�s life.